The day has come. 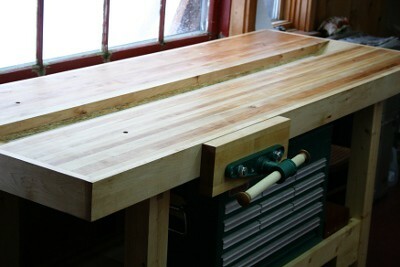 I have completed my first (real) workbench. Until now, I had screwed OSB onto an old dresser we had knockin’ around and stuck my grandfather’s old front vise on it. I guess the Yankee spirit usurped my pride. Working out of a small shed never seemed to demand a bench of any higher glory. Function overcame form. November 2011, almost exactly two years after moving to Maine, I signed the lease to my first workshop space. Situated in a renovated carriage shed of a 1790’s coastal cape, I find myself humbled and awed at the venture. Somehow the whole thing seems bigger than myself. As the sea calls it’s sailors, I find myself drawn and compelled to this craft. The smell of each crosscut, the whisper of the smoothing plane, and the satisfaction of partnering with such a beautifully designed material all have me to call this ‘home’. I am a woodworker. Hear my heart beat. Kirby’s base is constructed of Douglas fir which is one of the heavier softwoods. (Specific gravity of 0.48!) It seemed to me that if assembled with mortise and tenon joinery, with a heavy enough top, and a shelf built into it which would hold my 75 lb+ toolbox, and with rubber gripping under the feet, a pine base wouldn’t budge. I was right. The thing is rock solid. No tipping, sliding, or any such thing. The stretchers have blocks glued underneath at each end effectively doubling the tenon size. The top rail is a bridle joint and the bottom rail is again mortised in. The ¾” plywood shelf sits in a rabbet in the stretchers. The bench was glued with Titebond PVA and joints reinforced with ‘Timbertite’ 8” and 4” screws. (Seemed more straightforward than machine bolts.) The whole thing was wiped down with boiled linseed oil, then an oil/varnish blend (1 pt Waterlox /1 pt linseed oil thinned with a little mineral spirits), and finally modestly waxed. It feels smooth without being too slippery. Ah, the smell of linseed and the soft glow of figured maple. It bids me, “Come, let’s get to work!” And, alas, here I am: Set out to sail on my new vessel. A little tradition, a little innovation, and a whole lot of Divine supplication. Great job on the bench. And I like your writing style. I'd like to see some pictures of your shop some day. An 18th century carriage shed sounds like a cool place to work.